I really had no idea what to expect when I walked into NOCTURNAL ANIMALS. Directed by a fashion designer? What could Tom Ford bring to the table as a storyteller (he wrote the screenplay) and a director? Style over substance was my fear. Boy was I wrong. The movie is very stylish. It looks fabulous. The actors are beautiful and beautifully shot and clothed (wonder if Mr. Ford provided wardrobe). But it also dark and disturbing. Amy Adams is married to Armie Hammer. They live a luxurious life in the Hollywood Hills. She runs a gallery. He is in some business that we are told is struggling. After a successful opening, Adams receives a manuscript that is dropped off in her mailbox. It is from her first husband, who she left in the most horrible fashion. Adams begins reading and cannot put it down. The novel is a tale about a man (Jake Gyllenhaal), his wife (Isla Fisher in an inspired bit of stunt casting) and daughter who are driving across West Texas at night. They are harassed by 3 men led by Aaron Taylor-Johnson and run off the road. Eventually the women are killed and Gyllenhaal is abandoned in the desert. Adams is obsessed with the novel. She cannot put it down as it worms its way into her consciousness. It disturbs her as her life is falling apart. Her husband has gone out of town on “business”, but she discovers he really is hooking up with a woman in a New York hotel. It causes her to reexamine her life through a series of flashbacks. It details how she met her first husband (also played by Gyllenhaal), how they grew to love each other and how they fell out of love and how she left him. As the novel progresses, Gyllenhaal’s character gets to the police who begin investigating. The detective is wonderfully played by Michael Shannon. He is weary, yet tough and not above going outside the law for justice. Adams continues the novel and begins to hope for a meeting with her ex. I really don’t want to go anymore into the plot. But as you can tell there are three stories being interwoven. It had the potential to become a confusing mess, but it isn’t. It is clear when were in each different world. Casting Fisher, who could be Adams’ sister, is brilliant because it makes you believe the novel is really about Gyllenhaal and Adams’ marriage. The beautiful look of the movie plays wonderfully against the brutality of the story. Ford does a simply fantastic job. I did some research after seeing the movie and found he directed 2009’s A SIMPLE MAN. Never seen it, but now I will check it out. I think I also understand why Adams may have been passed over for an Oscar nomination for ARRIVAL. She is nearly as wonderful here. It is a quiet, gut wrenching performance. The votes may have been split. No idea. Just a theory to explain a diss. 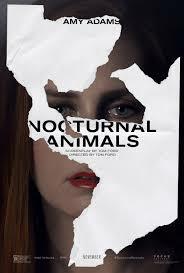 NOCTURNAL ANIMALS is a very good drama/love story/murder mystery. And Ford gets a lot of the credit for its success.